Game celebrates its first birthday on PC and Mac. 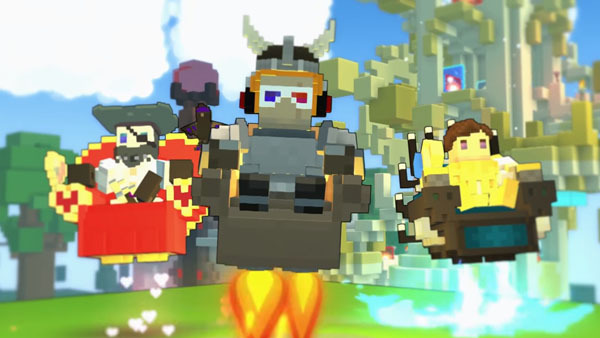 Trion Worlds is bringing Trove, its free-to-play voxel adventure online game, to PlayStation 4 and Xbox One this fall, the company announced. Trove originally launched for PC and Mac one year ago, and has since attracted more than five million players from more than 100 countries and released its first expansion, Mantle of Power, earlier this year. Trove invites players into a universe of endless possibility where action-adventure, role-playing, and crafting collide. By offering players the power to choose from more than a dozen character classes, battle against others, explore, craft, and create their own adventures, Trove pushes the boundaries of community-created content, featuring procedurally generated worlds that are fully buildable and destructible. As the game celebrates its first birthday this week, Trove is being played by millions of gamers from more than 100 countries every month, and has inspired creativity in numerous novel ways. Thousands of weapons, mounts, costumes and other collectible items created by players are now in the game, as are dungeons, clubs and other environs forged by Trove’s passionate global audience. Watch the console announcement trailer below.